Shawl is knit in the round. 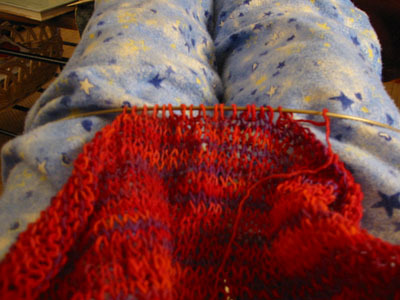 After reaching desired width, bind off all but 16 stitches. Drop remaining stitches from needle. 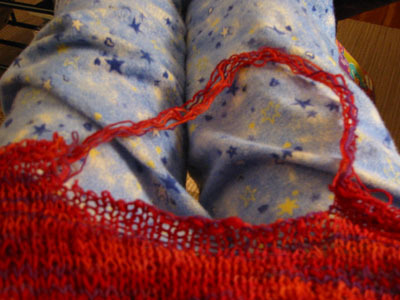 Cut straight through the middle of unraveled stitches. P.S. Process pictures were taken during a late-night knitting session with two of my closest buddies. Dig the PJ bottoms? The stars glow in the dark. Jealous, aren't you? Wow, it looks great! I have got to try making that. Do the glow in the dark stars freak you out at night? I always get freaked out when I've forgotten that a few of the boys' pj's have glow in the dark designs and I sneak into the room late at night to check on them and they're glowing! Excellent. I love that shawl. Is it just knit in the round in st st or is there a stitch pattern? I didn't get to see it when you were at Knitsmiths. Either way the construction is brilliant with the built in fringe! So... the sts that are bound off don't unravel even though the sts next to them have been mutilated? Magic! Or does one need to knot the fringe up at the top to keep more unravelling from happening? Please tell! 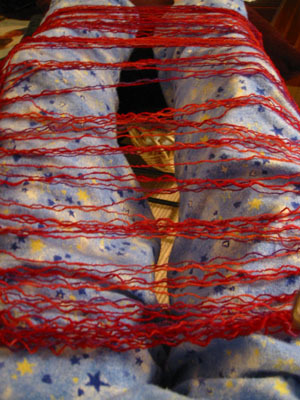 It's very clever -- the last stitches are knit into the BACK of the stitch, which "locks" them. 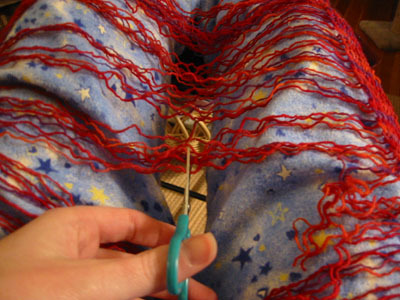 When you drop the 16 stitches between the locked stitches, the unravelling stops at the appropriate place and will not go any further. Even if you pull. Which I did! Wow! 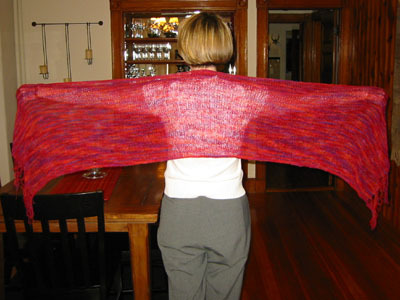 That's a pretty cool way to do fringe on a shawl. Very clever indeed!